being MVP: Learning Resources: Pretend & Play® Gym Bag & Giveaway! 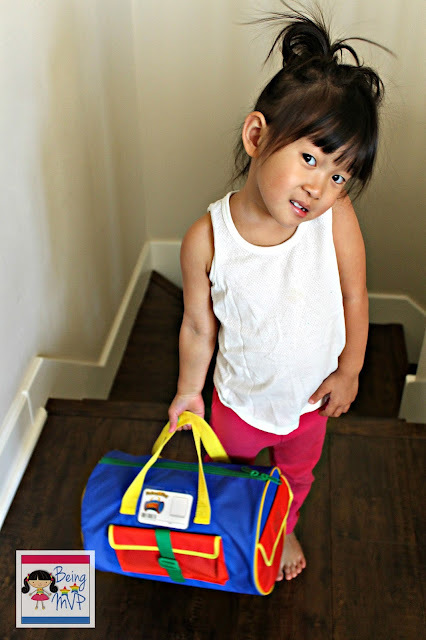 Learning Resources: Pretend & Play® Gym Bag & Giveaway! Kenzie is so inquisitive and aware of everything and has been into this exercise kick since discovering daddy is at the gym every morning when she wakes up. When the Pretend & Play® Gym Bag arrived for review, she couldn't open it quick enough to get her workout on. This delightful gym duffel bag comes equipped with the following: gym ID, dumbbell, lock & key set, water bottle, stop clock, wristband, basketball, soccer ball and exercise chart. 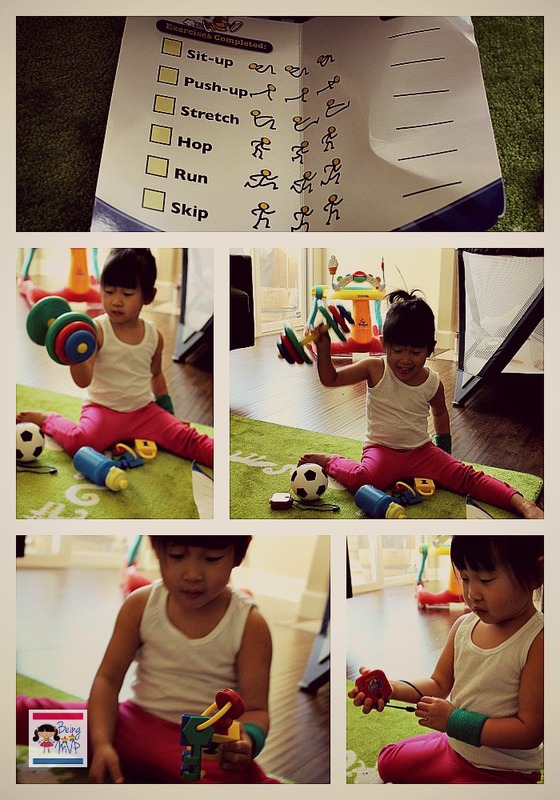 Kenzie was enthusiastic about starting her exercise regimen and proceeded to do some exercises with the kids dumbbell. She loved the lock and key set because it really does work! You lock it and then use one of the 3 keys (which correlates to three sides) to open it. The stop clock is also great for time keeping as it moves from 1 through 10 with each click. The water bottle can hold real liquids and after a quick wash, she wanted to use it as her cup for dinner time. Mason also got in on the exercise action as he immediately gravitated toward the two balls. They are soft and spongy making it easy for Mason to grasp and throw. He loves these balls and has a ton of fun with Kenzie tossing and rolling back and forth. This kids gym bag set is perfect for mimicking daddy in his real life workouts and the pretend play makes for healthy habits later in life. 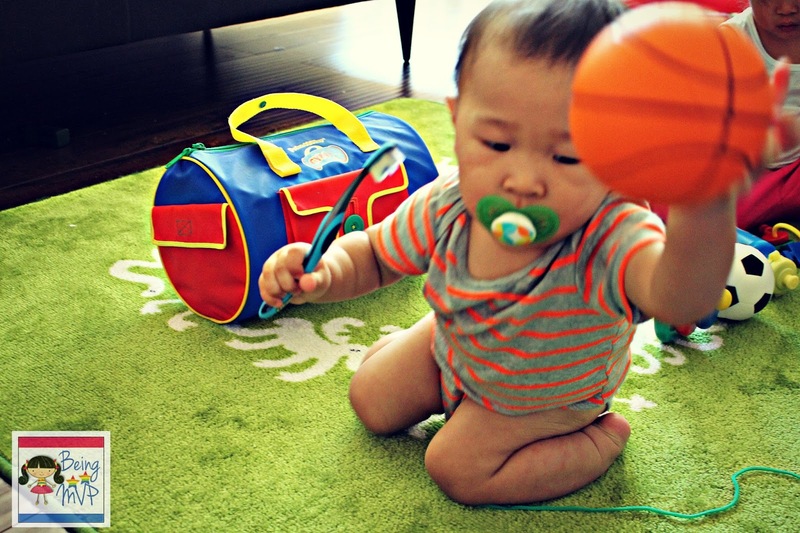 Exercise and healthy eating are key components to a toddler's life. Thumbs up for another fabulous Learning Resources product. Buy It: You can purchase the Pretend & Play® Gym Bag for $34.99. 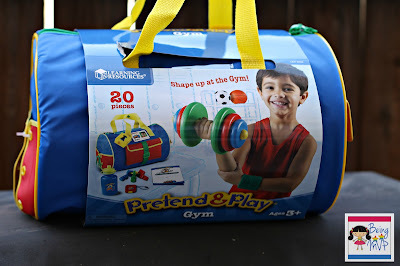 One Winner will Receive a Pretend & Play® Gym Bag! the hide and go fish game looks cute! I would like the Twisty Droppers™ for my 2 year old. I want to get the Teaching Cash register! My daughter would love Ten-Frame Treasures. I would like to have the Smart Snacks Shape Sorting Cupcakes. I think my son would also like the Learning Resources learn and play fishing set. Riddle Moo This looks like fun! I would love any New Sprouts food collections. We'd have fun with the New Sprouts Dinner Basket! My daughter loves to help her daddy around the house, so I think she'd love the Simple Tape Measure. The Jumbo Dinosaurs, my son would love them. Learn and play fishing set. Pop for Addition and Subtraction for my son. He is headed to 1st grade and could benefit from this cute game. My niece loves anything that involves animals. She would love the Jumbo Farm Animals set! The twisty droppers is what I would buy! I like the counting cookies! 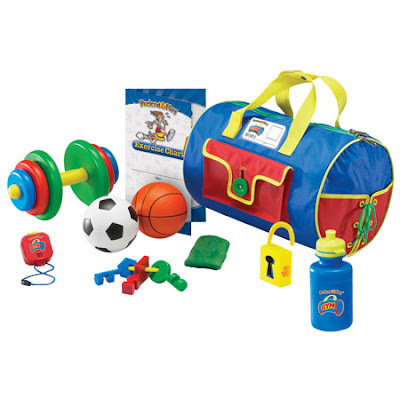 I want the Pretend & Play® Camp Set, for my son! the counting cookies are great! I like the rhyme and sort rockets. I like the gears beginner building set. I like the new sprouts ring it up register! I like the Crocodile Hop Floor Game! What a fun way to keep the kids active! I love their New Sprouts Lunch Basket. The twisty droppers look fun. my son would love the pretend and play camp set! I like the New Sprouts Fix it! My very own tool set. I also like the Talking Electron Microscope from Educational Insights. I also like the Primary Science Plant & Grow Set. My cousin would love the New Sprouts Picnic Set. I would love the New Sprouts® Cure It! I like the iTrax game. Primary Science Sensory Tubes are awesome! I like The New Sprouts Cure It!! I like the Super Skills Bingo. Teaching cash register is super cool and I know my daughter would really enjoy it! We love our Hot Dots! My son would love the letter construction set. Love their calendar & weather pocket chart.